Mork & Mindy/Laverne & Shirley/Fonz Hour is a 1982 cartoon series produced by Hanna-Barbera and Ruby-Spears Productions in association with Paramount Network Television, featuring animated versions of characters from Mork & Mindy, Laverne & Shirley, and Happy Days, all part of the same franchise. This Saturday morning series lasted for one season on ABC. This show was divided into two segments, entitled Mork & Mindy and Laverne & Shirley with the Fonz. In the Mork & Mindy segment, in which Robin Williams and Pam Dawber voiced the title characters, a teenaged Mork is sent to Earth from planet Ork to observe the lives of human teenagers and enroll in a local school. As on the original show, Mindy McConnell and her father Fred (voiced by Conrad Janis) are the only Earthlings who know that he’s an alien, and he sends telepathic reports of his experiences to Orkan ruler Orson (voiced by an uncredited Ralph James). 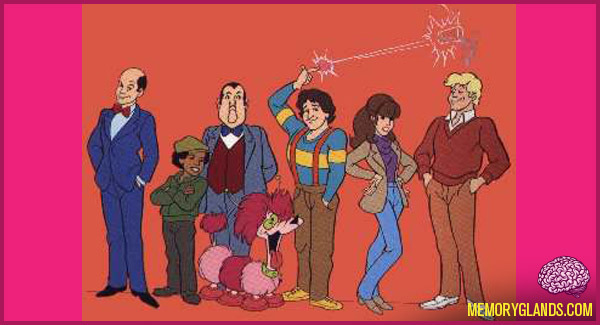 Unlike the original show, Mork is accompanied by his Orkan pet, a pink six-legged dog-like creature named Doing (voiced by Frank Welker) which is pronounced as “Doyng.” Other characters in the show included Eugene (voiced by Shavar Ross), Hamilton (voiced by Mark L. Taylor), and Principal Caruthers (voiced by an uncredited Stanley Jones).